Breeze FM has done it again. This time it is the Environmental Award. 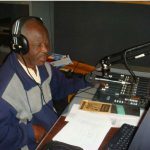 The Zambia Environmental Management Agency (ZEMA) has awarded Breeze FM Producer of ‘’Our Environment ‘’ programmes, Peter Frank Banda the 2013 Electronic Media Award in recognition for contribution to environment and development journalism. The award is among others bestowed on deserving individuals and institutions at an annual event which is held as part of the commemoration of the World Environment Day which falls on June 5th. iv. Recognise corporate social responsibility that promotes sound environmental management and commitment to continuous environmental improvement.